"Huge Affiliate Opportunity! You Get $90 Per Sale On This INCREDIBLY High Converting And Best Selling Package." Test Your Traffic With Us! Converts On "Woodworking", "DIY", "Survivalist", "Green Energy" Traffic! 75% Commissions - 9% Cold Conversions - Total $90 Per Sale! Are you looking for BIG affiliate paychecks? With a total of $90 per sale and 1 in 10 conversions, there is no wonder why super affiliates are loving us. We're the #2 woodworking product on Clickbank but we work much harder! That means we split-test more vigorously and we're constantly adding value to our product. That means easier sales and lower refunds for you - which means you get to earn more commissions and KEEP it! Our initial tests on the Clickbank marketplace has converted as high as 9.6%! That's nearly 1 in every 10 targeted visitors buying. Our affiliate program is FREE to join. You can instantly generate an on going stream of income without any cost or obligation on your part. Requirement: You must have a ClickBank account. If you don't have one, you can sign up for a Clickbank account for free. Once you have a Clickbank account, you'll get a Clickbank "ID"/"nickname". That is all you need to begin. Replace 'xxxxx' with your ClickBank nickname. Our main affiliate link converts the HIGHEST so in most situations, use the main link. However, we've setup several custom landers for affiliates who have specific requirements for PPC/CPA networks. We boast one of the highest converting salespage in our industry. Send some traffic and see why super affiliates are loving us! Unlike other vendors, we offer 75% across all upsells and downsells. That gives you a total potential of $103 per sale! Your conversions will keep soaring overtime, due to our split-tests and multi-variate tests done by our conversion optimization gurus which means even MORE money for you. We’ll follow up with your visitor over and over again until the sale is made. You will get all commissions from any email follow ups. 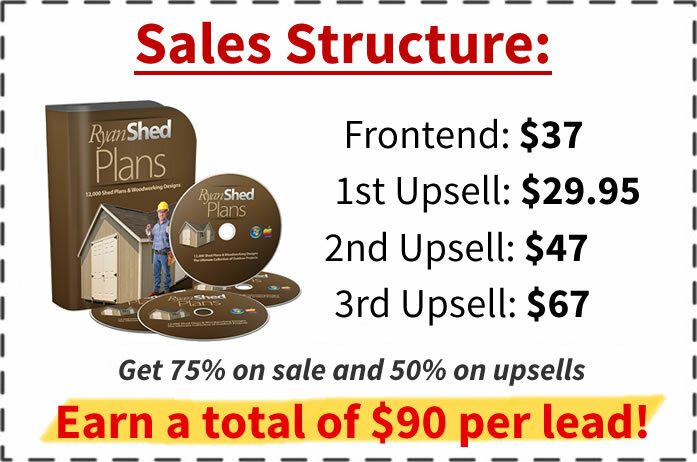 Customers love our wide range of shed plans – backed up with an almost 24/7 support team. That means lower refunds and you get to keep your commissions. We maximum your opportunity for more commissions via upsells and OTOs. There is always a point where maximum price meets sales volume. We are confident we have found the perfect price point and can therefore pass an incredible 75% in commission on to you. Sign Up To Get Access To Your Affiliate Tools & a FREE Report Titled: "48 Hour First Commission Quick Start Guide"
Simply enter your email address below and you'll be taken immediately to our affiliate resource page where you can get banners, keywords, demographics, email swipes and more!